The eye depends on the flow of tears to provide constant moisture and lubrication to maintain vision and comfort. Tears are a combination of water, for moisture; oils, for lubrication; mucus, for even spreading; and antibodies and special proteins, for resistance to infection. 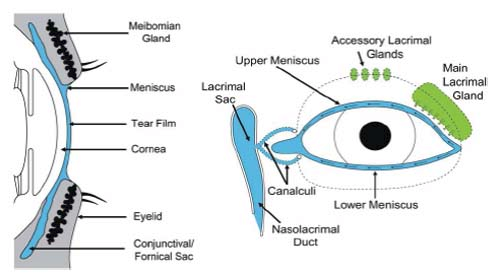 Special glands located around the eye secrete these components. When there is an imbalance or deficiency in this tear system, a person may experience dry eye. Dry eye results from a decline in the quantity and/or quality of the tears produced or when there is an increased rate of evaporation of tears from the surface of your eyes. This can cause the eyes to feel irritated, tired, scratchy and uncomfortable; they may appear red and burn. Dry eye is the most common eye condition encountered by ophthalmologists. Its incidence has increased over the past two decades due to the increasing use of computers, contact lenses, air travel, poor air quality, etc. There can be significant long-term health consequences for your eyes if dry eye is not properly addressed and treated. Untreated, chronic dry eye becomes increasingly uncomfortable adversely affecting your quality of life, even leading to desiccation of the skin on the front of your eyes with scarring, and an increased incidence of infection with potentially serious visual impairment. Sometimes, a person with dry eye will have excess tears running down the cheeks, which may seem confusing. This happens when the eye isn't getting enough lubrication. The eye sends a distress signal through the nervous system for more lubrication. In response, the eye is flooded with emergency tears. However, these tears are mostly water and do not have the lubricating qualities or the rich composition of normal tears. They will wash debris away, but they will not coat the eye surface properly. In addition, because these emergency tears tend to arrive too late, the eye needs to regenerate, and treatment is necessary. Mr. Srinivasan is one of the first ophthalmologists in Scotland to use the most advanced, state-of-the-art, latest technology to objectively test/measure dry eye. Ayrshire Eye Clinic and Laser Center has become the first Tear Lab accredited Dry Eye Centre in Scotland for the accurate diagnosis and management of dry eyes. The TearLab osmolarity system painlessly measures a small sample of your tears to objectively quantify, using "lab on a chip" technology, how "dry" your eyes are. 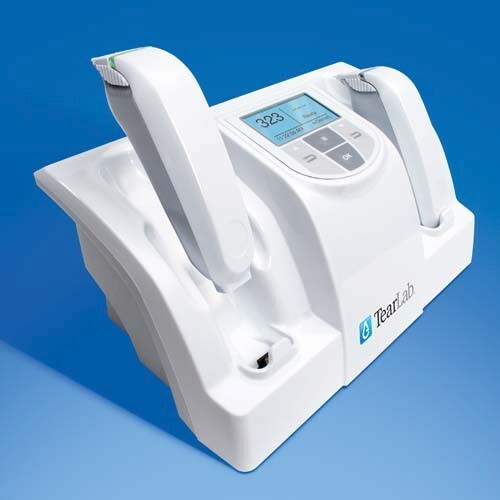 The ability to measure and quantify tear osmolarity objectively with the TearLab system facilitates the diagnosis, treatment and the management of dry eye. History of Accutane use, chemotherapy, radiation, etc. The first line of treatment for dry eye is using artificial tears (over the counter products). Most people also find tear augmenters (punctal plugs) of great benefit. This work by decreasing the rate at which the tears run off of the ocular surface thereby enhances the quality of your vision, your comfort level and the health of the surface of your eyes. There are also nutritional supplements high in Omega-3 fatty acids and prescription eye drops, ointments that Mr. Srinivasan may recommend. Each treatment regimen is completely customized to address your individual needs based upon your symptoms and the findings seen upon your examination. 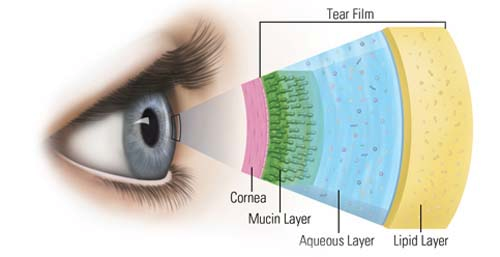 Artificial tears provide dry eye relief by lubricating your eyes. These tear products are widely available over-the-counter, without a prescription. Preservative Free Artificial Tears - These products vary in their consistency; some are the consistency of water, while others are thicker, or more viscous. You should begin by using these drops 4-6 times each day. The more the better; you cannot overdose on tears. These drops can be instilled in your eyes with your contact lenses in. Preservative Free Liquid Gels - These products are more viscous, or thicker, than water and therefore stay on the ocular surface longer. The drawback is that they can blur vision, but only slightly and only temporarily (i.e. for one to two minutes). If you are able to tolerate these during daytime hours they are very healthy for your eyes. You should use them a minimum of four times a day. If you cannot tolerate minimally blurry vision during daytime hours, you can use them at bedtime. The more you use gel, the better; you cannot overdose on it. Preservative Free Ophthalmic Ointment - This is an ointment to be used at bedtime. It will help to moisturize/ repair your eyes overnight while you sleep (it unfortunately blurs your vision and therefore is usually limited to use while you're sleeping). Omega -3 fatty acids, ideally from both fish and flaxseed sources, are very healthy. Omega-3 fatty acids have a beneficial effect on dry eye due to their anti-inflammatory properties. They are also essential fatty acids that your eyes, lids and tear film need to function their best, be their healthiest and their most comfortable. Unfortunately, our body cannot produce them and most of us don't get enough Omega-3s from our diet. Our tear glands are located under our upper eyelids. These are the glands that produce the tears that bathe the front of our eyes. The tears leave the surface of our eyes through small holes in the nasal aspect of the upper and lower eyelids called ducts or punctum. Tear augmenters, or punctal plugs, are gently and painlessly placed in these small holes. They block a significant percentage of the tears from leaving the ocular surface as quickly as they are produced. In this way they optimize, or maximize, your own natural tears by keeping them on your ocular surface longer. Prior to placing the tear augmenters Mr. Srinivasan will place anaesthetic eye drops on your eyes to numb them for a few minutes. When the plugs are placed you will feel no pain or discomfort; it takes a few minutes. You should not feel or see the tear augmenters once they're in place. Your eyes should be more comfortable, you should be less aware of them and your vision should be sharper and better. Restasis is a prescription eye drop that you instil in your eyes twice each day (i.e. morning and evening). It helps by increasing the production of tears by your tear glands and protecting your tear glands from ongoing damage. By halting the damage to your tear glands you can halt the progression of your dry eye condition and keep it from getting worse over time. Restasis is unique in that it treats the underlying inflammatory process that causes and characterizes dry eye. In addition, there are prescription medications such as Doxycycline, steroid eye drops and prescription ophthalmic ointments, etc. Mr. Srinivasan will place you on one or more of these if he feels that you would benefit from them as part of your individual treatment regimen. Using a humidifier for travel, on your desk and/or at your bedside is of benefit, especially in the autumn and winter when the environment is dry and the heat is on. Staying well hydrated is extremely important. Getting 7-8 hours of sleep per night is also very helpful. Treating any associated eye conditions can help to alleviate dry eye symptoms (i.e. treating coexisting blepharitis, allergic conjunctivitis, etc. ).